This is an ambigram which mixes up the "Happy Holiday" greeting. Letters misplaced, up-side-down. 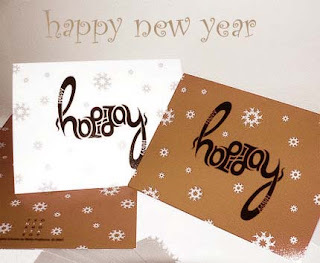 Happy New Year to all the loyal Sepia Scene-ers! Happy New Year, Teach Mary. I have never heard of an ambigram before, There have only been anagrams in my little world. I like to have my horizon extended and am happy to have learned a new spelling technique. Life should be just fun between Christmas and New Year. - and i wish you a Happy new year ! I've always loved ambigrams, since I was a little kid. Cool stuff. Happy to be back to Sepia Scenes. I've been away a while. Happy New Year to you, and many thanks for a lovely photo chain. Happy New Year, no matter how it may be presented!